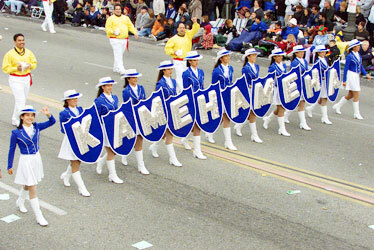 Kamehameha Schools, whose band is shown here in the 2002 Rose Parade in California, is launching an initiative to give scholarships to native Hawaiian students enrolled at other private schools in the state. Under a new program, Kamehameha Schools will award a number of scholarships to native Hawaiians entering kindergarten at other independent schools in the state. Private schools are welcoming the program, saying it will give disadvantaged Hawaiians access to a high-quality education, increase student diversity at their campuses and save taxpayers money. "It goes a long way in supporting the public purpose of private schools," said Mike Baker, president of Maryknoll School, which will admit four kindergartners granted scholarships from Kamehameha Schools. "After all, these students would be -- if they weren't at Kamehameha -- they would be in public education. This is a savings to the community." The initiative, beginning with the 2008-09 academic year, will expand Kamehameha Schools' Pauahi Keiki Scholars Program, started in 2003, which provides tuition help to more than 800 students in 100 isle preschools. Robert Witt, director of the Hawaii Association of Independent Schools, said the plan is part of "one of the most powerful and prominent forces for good at work in our community today." Kamehameha Schools, in an effort to educate native Hawaiians it cannot accommodate, will begin awarding scholarships for students enrolling in kindergarten at other private schools in the state. Backed by a multibillion-dollar trust, Kamehameha Schools will offer tuition help for students entering kindergarten each year at accredited independent schools starting in the 2008-09 academic year. The number of scholarships has not been announced. Private schools are praising the initiative as a way to give native Hawaiians a shot at a high-quality education and increase the ethnic diversity of their campuses. More important, they say, it follows the 1883 will of Princess Bernice Pauahi Bishop, who, according to Kamehameha Schools, set up the educational system to remedy social and economic disadvantages endured by native Hawaiians. But only about one in eight applicants gets in because of heavy demand generated by a $9 billion-plus charitable trust used to subsidize costs to students. It is unclear how much of a private school's tuition the new scholarships will cover, which Hawaii private schools will be eligible or the program's cost to Kamehameha Schools. Under guidelines announced to private schools, students granted the kindergarten scholarships in the first three years of the program would receive aid until graduation. Kamehameha Schools spokeswoman Ann Botticelli declined to provide specifics about the program, saying yesterday officials were still determining how many students would participate. "Until the schools know how many kids accepted invitations, we don't know the final numbers yet," she said, adding those figures should be available next week. Last fall the Hawaii Probate Court approved Kamehameha Schools' plan to broaden its Pauahi Keiki Scholars Program -- which has provided need-based financial assistance to Hawaiian preschoolers since 2003 -- for kindergartners, according to a news release by the National Association of Independent Schools. Robert Witt, director of the Hawaii Association of Independent Schools, and its associate director, Roberta Bishop, hailed the expansion. "We believe this plan, along with its commitment to 'extend the reach,' is one of the most powerful and prominent forces for good at work in our community today," they said in a joint statement to the NAIS. More than 800 3- and 4-year-old students attend 100 preschools statewide under Kamehameha Schools scholarships, according to the schools. So far, Kamehameha Schools has invested more than $15 million at preschools, Witt told the NAIS. Maryknoll School, whose preschool has taught about three Kamehameha Schools scholarship recipients, will enroll four kindergartners getting funding through the new program, said President Mike Baker. The Catholic school will pay one-third of its $10,900 tuition for each of the incoming students, with the remainder being covered by the scholarships and possibly some money from parents, he said. Baker said the deal gives Hawaiians, in addition to access to expensive schools, the opportunity to apply for an education based on their faith. "Expanding choice, I think, is the most important thing about that for the Hawaiian community," he said. At Iolani School some 40 children have applied for Kamehameha Schools' kindergarten scholarship, said Headmaster Val Iwashita, who hopes it will bring more Hawaiians to campus and boost diversity. "The mix of students tends not to be a significant number of Hawaiians," he noted. "That infusion of interest and potential enrollment is very positive for our school community. To just have people of different walks of life interacting with each other, I think, in the long term serves all of us well."